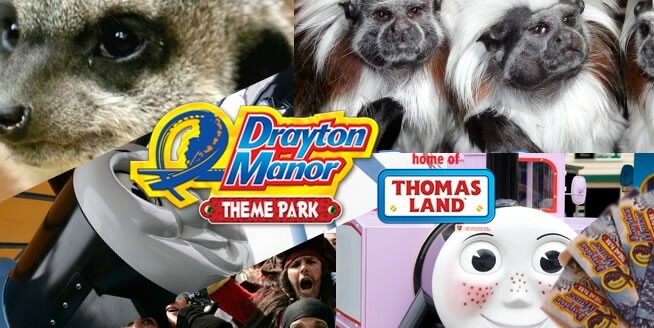 Drayton Manor is Uk’s number one family theme park featuring the famous ThomasLand. The grounds consist of lakes and parkland which are packed with a host of great rides and attractions including: Thomas Land, Apocalypse, G Force, Ben 10 Ultimate Mission, 4D rides and a Family Zoo. Please ensure that the park is open on the date that you are planning to visit. To book the the package below please enter your details below and click ‘Submit Message’, or contact us direct by telephone on 01827 63120. Drayton Manor Theme park is fully open from 28 March 2018 until 31st October 2018. It then re-opens in November (selected dates only) and December for ‘Drayton’s Magical Christmas’. Please check directly with the park for opening times and restrictions.